Everyone is making fun of Johnny Depp for that odd dog-smuggling apology video — even the Australian government. In a subsequent interview with CNN affiliate Channel 7’s “Sunrise” show, Joyce suggested the “Pirates of the Caribbean” star “do it again” — this time, with “a little gusto.” That all said, Joyce appears pleased with the general message of the strange mea culpa, which is posted above. Depp and his wife, actress Amber Heard, failed to declare their Yorkshire terriers when entering Australia last year, leading the deputy prime minster to threaten euthanasia (of the dogs, not the Hollywood stars). Heard appeared in a Queensland court on Monday, where the apology video was played. The “Magic Mike XXL” actress pled guilty to knowingly producing a false or misleading document. Two other charges of illegally importing the pooches were dismissed. The court magistrate gave the “Danish Girl” star a one-month good behavior bond sentence, per Channel 7. If Heard breaks the bond, she’ll face a 1,000 AUD fine ($767), but the incident will not go on record. Roberts starred for two seasons as the mother to Donna Pescow's Angie in the 1979 ABC sitcom of the same name. Still in denial about her husband's desertion of the family, the character continued to set a place for him at the table 19 years later. Roberts won her first Emmy in 1983 for her guest role on "St. Elsewhere," playing a homeless woman visiting the St. Eligius teaching hospital as a patient. Roberts joined the cast of the detective drama "Remington Steele" as secretary Mildred Krebs in Season 2 in 1988, replacing James Read, who departed the show after one season. In 1989, Roberts appeared alongside Chevy Chase, Beverly D'Angelo and Randy Quaid in the modern Christmas classic "Christmas Vacation," written by John Hughes and directed by Jeremiah S. Chechik. Roberts also earned one of her 11 total Emmy nominations for her guest role on ABC's "Perfect Strangers" in 1989. 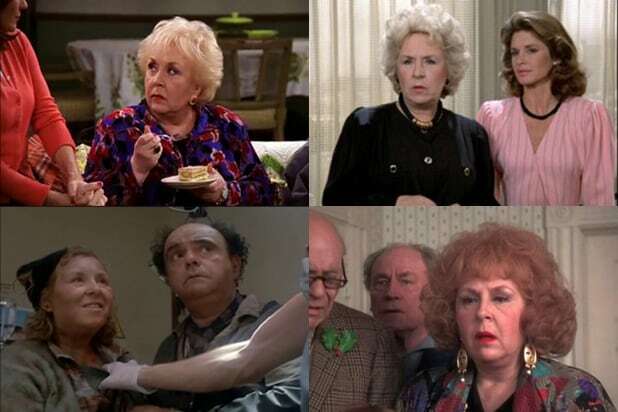 Doris Roberts is best known for portraying Marie Barone, the meddling mother of Ray Romano on the long-running CBS sitcom. For the role, Roberts earned seven Emmy nominations, and four wins for Outstanding Supporting Actress. Allen Covert starred as a video game tester forced to move in with his grandmother, played by Roberts, in the 2006 stoner comedy "Grandma's Boy."